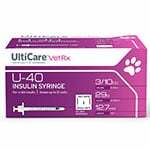 Buy UltiCare U-40 VetRx Insulin Syringes 29 Gauge - 100 per box online! UltiGuard UltiCare VetRx U-40 Insulin Syringes - 29 Gauge 3/10cc 1/2inch (12.7mm) - Syringe Dispenser and Sharps Container. For 12 units or less. 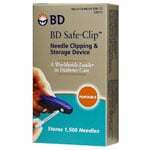 Latex-free, All-in-one syringe and disposal container, safe and tamperproof, convenient and ready to use. 100 per container. 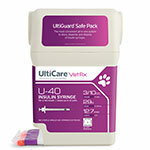 The UltiCare VetRx Syringes by Ulti Med are made specifically for veterinary use. Many veterinarians are now prescribing Protamine & Porcine Zinc Insulin (PZI & Vetsulin) known as U-40. 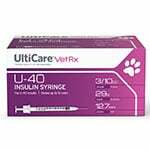 Though not a diluted form of insulin, U-40 is weaker, thus allowing for larger, more easily measurable doses for small animals. 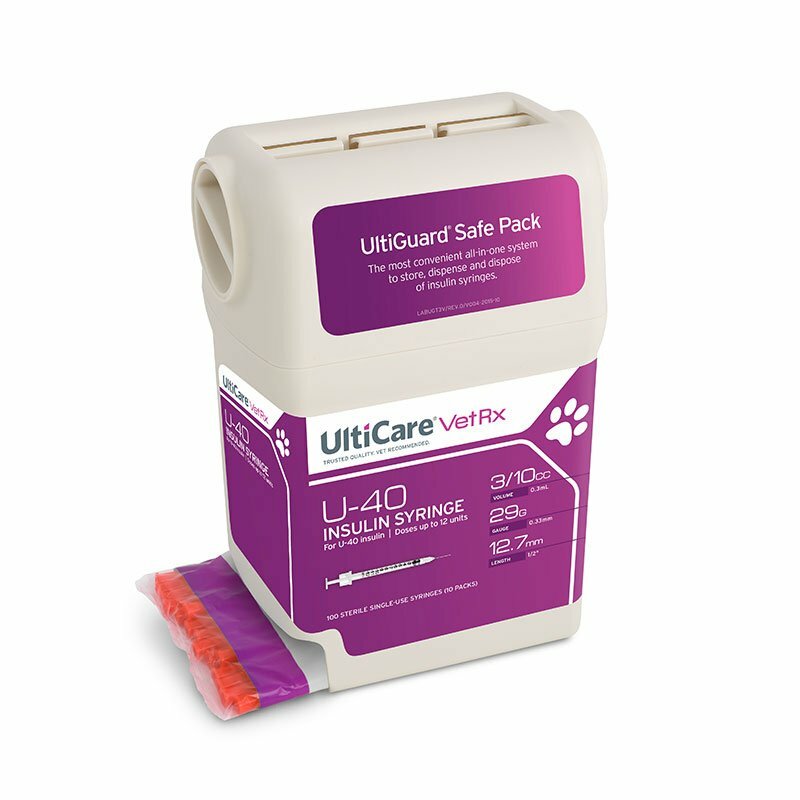 The UltiCare VetRx syringe allows for more simplified and accurate dosing of U-40 medications, without complicated mathematical conversions, giving diabetic pet owners an ease-of-use and level of accuracy that had not been available until now. Insulin syringes that hold smaller volumes of insulin are typically used for smaller animals while large volume syringes are reserved for larger pets. Best price around, quick delivery and staff is friendly to work with. Lucy doesn't mind getting her shots. She hears the cap coming off the syringe and she comes running! My rag doll Siamese kitty, Stewie, was diagnosed as diabetic last December. I bought the first couple of syringes from the vet, until I found your website. Since then, I’ve ordered from ADW and the savings is a godsend. ADW offers very reasonable prices and fast service! I would definitely recommend them! My precious senior yorkie is a diabetic. This is a very expensive disease with vetsulin, meters, test strips, special food, vet checks, and of course syringes. I have found that by purchasing in bulk, I receive a discounted price , free shipping and Ulti has a discount coupon . On the average, I save about $10.00 per each container buying from you in bulk . You have excellent customer service, superfast shipping and the best price to be found. Thank you so much. Every dollar counts when taking care of a diabetic fur baby. 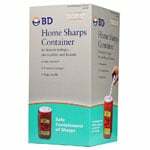 The product is excellent, easy to use, and the container has a disposable feature for the syringes. Thank you ADW !! 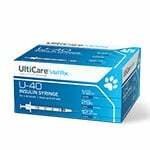 I have been purchasing these syringes for the last year for my dog, and they are easy to use and reliable. I did purchase another brand at first but these are the best and the container makes them easy to recycle at the county station. They will not take them without the container. Great syringes, excellent price and quick delivery. Very happy with the service. Get site to order from with same product sold by my Veterinarian office but at a much higher price. I am set up for auto-mailing so I never have to worry about ordering, which is great with my busy schedule. My pet is always ready to receive her injections and these syringes seem to be pretty painless. The cost on this site is outstanding! Great price, easy ordering and delivered as they said they would. Will be buying here again! great product at an even greater price (better than my vet's office) Thanks for saving me money! We love the Autoship option. It makes caring for our diabetic cat so much easier, and at less cost than the vet.